Kevin Nepveux, center, a Pfizer vice president, calls Stevens a strong partner in teaching leadership skills to technical employees. From left, student Mona Babury, Dr. Chris Asakiewicz, Nepveux, and students John Alleyne and Cindy Dever. As a scientist who has ascended the leadership ranks, Kevin Nepveux is in a unique position to appreciate the value of management programs at the School of Business at Stevens. Nepveux is vice president of global technology services for Pfizer Global Supply, the company’s global manufacturing organization. An engineer by training, he leads a team of scientists and technologists who steer products from R&D to manufacturing and maintain the current product pipeline — which could mean troubleshooting potential problems or developing new technology to take advantage of market opportunities and help bring more medicines to patients in need. 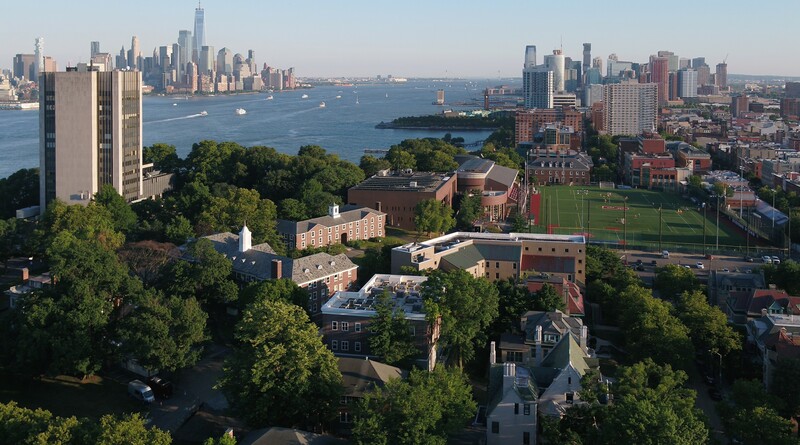 When he looks at the business degrees Stevens offers, he sees a valuable partner in delivering corporate education programs. Nepveux helped champion a collaboration between Pfizer and Stevens that has helped more than 100 Pfizer colleagues further their professional development, whether through an MBA, another graduate degree like the master’s in Business Intelligence & Analytics, or a graduate certificate in a specialized field. In 2016 alone, 75 new students enrolled in the MBA program, with nearly two-thirds of them women. Currently, Stevens is running four cohorts at Pfizer — at its Peapack, New Jersey, location and its New York headquarters — that prepare students to manage the technology-driven opportunities of the future. Dr. Chris Asakiewicz M.Eng. ’83 Ph.D. ’03, an industry associate professor at Stevens who directs its Business Intelligence & Analytics master’s program, said the analytics and technology-infused management degrees at the School of Business offer unique value to companies like Pfizer. Dr. Asakiewicz received his Ph.D. from Stevens more than a decade ago while working as vice president of global business technology at Pfizer. Since then, he said, the School of Business has developed considerable strength in important areas like analytics and decision sciences. That’s drawn interest from employers like Pfizer, which also benefit from Stevens’ ability to easily send faculty to corporate locations in the greater New York area. The corporate MBA program helps employees forge tighter bonds across the company. From left, Pfizer employees and Stevens students Mona Babury, Cindy Dever and John Alleyne review a project together at their Peapack office. Michael Baran, senior director of business operations and scientific affairs at Pfizer, has worked closely with Stevens on the company’s Business of Science initiative, which encourages technical colleagues to broaden their skills through the classroom. Bill Mestrandrea, a senior manager of quality assurance at Pfizer, said his colleagues have become a “band of brothers” through the MBA program, which he’s been a part of for three years. Colleagues in Stevens classes are a 'band of brothers,' says Bill Mestrandrea. Mona Babury, a senior portfolio manager at Pfizer, said her Stevens coursework has helped her better embrace the company’s “OWN IT!” culture, which promotes accountability, innovation and thoughtful risk taking to help drive results. An early assignment included an understanding of her strengths and weaknesses; because all of the courses are conducted onsite, it was easy for her to ask her manager to be part of that assessment. Those skills in economics, operations, marketing and strategy are what Kal Vadasz, director of corporate partnerships for the School of Business, calls the “language of business” that’s at the heart of what a Stevens management education is all about. That’s certainly true of Cindy Dever, who came to Pfizer in 2011 as a senior business analyst. Today, she’s the senior manager of marketing and strategy development for Pfizer’s Greenstone division, the result of several promotions she said are in part due to her Stevens coursework. In her new role, which she’s held since May 2015, she leans heavily on the lessons she took away from marketing and strategy classes at Stevens. Mestrandrea, meanwhile, said the analytics focus of his Stevens classes has been especially helpful as he thinks about his approach to his work. That’s why Nepveux is so pleased with having Stevens as a partner. In fact, he’s seen the value provided by Stevens firsthand, as his son Ryan graduated with a degree in Business & Technology in 2012. To learn more about corporate partnerships at the School of Business, please contact Kal Vadasz.